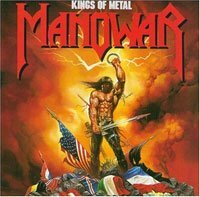 MANOWAR - KINGS OF METAL VINYL (2LP) | Online Shop | Wizard LTD. Album: "KINGS OF METAL VINYL (2LP)"
Kings of Metal is the sixth album by heavy metal band Manowar. Released in 1988 by Atlantic Records, it is thought by many to be among their very best releases. The album was also the last to feature guitarist and founding member Ross "The Boss" Friedman, who later went on to rejoin punk band The Dictators. "THE NUMBER OF THE BEAST VINYL (LP BLACK)"
"A MOMENTARY LAPSE OF REASON REMASTERED VINYL (LP BLACK)"
"SEVENTH SON OF A SEVENTH SON VINYL (LP BLACK)"
"KILLERS VINYL RE-ISSUE (LP BLACK)"
"IN THE NIGHTSIDE ECLIPSE 2017 RE-ISSUE (DIGI)"
"I NEW REMASTERED VINYL (LP)"
"PIECE OF MIND VINYL (LP BLACK)"